The Scottish Episcopal Church is a Province in the World Wide Anglican communion. It traces its history to a distinct strand within the Scottish Reformation. 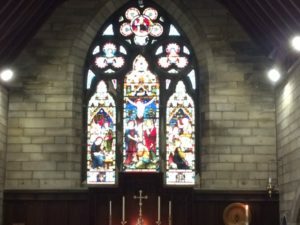 Although a minority church it has played a prominent role in Scottish life and culture and even found itself subject to political sanctions in the past. St. Peter’s Church began its life in 1851 and at first met in a house in Wilderhaugh. The present building is a Gothic Revival style Hay and Henderson 1853. Reredos Sir Robert Lorimer 1914. Stained glass, memorial brasses. The original setting was of church with lawns, graveyard, hall and rectory & encapsulated the Tractarian ideal. 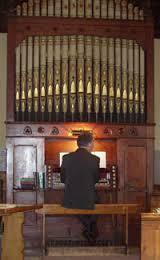 Fine 2-manual tracker organ by Brindley and Foster 1881. St. Peter’s school, no longer a church school today, was opened in 1859. In 1983/4 the Scott Aisle, of the church was blocked off and the present hall at the side of the church created. 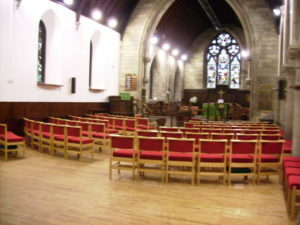 In 2005 the church had a major refurbishment, in the course of which the pews were removed, a new wooden floor laid and chairs donated by members and friends. This has given much greater flexibility in the way the church can be used and the church is benefiting in a variety of ways. Both the church and the church hall are wheelchair friendly. For those with hearing problems, there is a T-loop installed in the church.